U7 Kids soccer drills - this ones called 'Tunnel Ball'. Kids Soccer Drills - Tunnel Ball! Kids soccer drills must be fun and informative. Tunnel Ball is a favourite amongst many U7 players and also includes a competitive side to the game of soccer. The really good news is that it isreally easy to set-up. Take a look at the diagram below for Tunnel Ball. It's a really easy set-up, get the players into groups of three with one soccer ball between them. This is a game where points are recorded by the players and the player with the highest points at the end would win (if you do not want to make it so competitive, that's fine). The game is called tunnel ball and is a passing accuracy game where the player must kick/pass the ball between the middle persons legs. The person in the middle will stand with their legs apart with plenty of room for the ball to pass through. 3 Points - given for getting the ball all the way through the middle players legs without hitting the legs. 1 Point - given for hitting the legs but still getting through the players legs. These should be quick fire rounds as kids soccer games like this shouldn't have any player standing around for too long. The coach should give the players around 2 minutes before swapping the player in the middle. Instead of timing the players per round you could use "first player to ten points wins" for example. This allows the players to keep track themselves as to when the game will endjust be aware that some players may finish a lot sooner than others. Rather than the players being against each other in the three's, they could be playing against another team of three. Stand the groups of three players next to each other and tell them that the first team to 'ten points' will win the game. 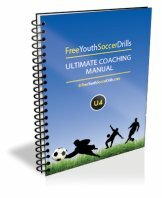 Kids soccer drills like this can be adapted for the older age group too. The outside player passes the ball to the middle player who passes it back to the outside player once more. This player then has to pass the ball between the middle players legs first time. This is much more difficult and should probably only be attempted by more skilful players perhaps U9 upwards. -> Make sure the kids look up before passing to work out why the ball goes in the direction it does. See other U7 Kids Soccer Drills - Click Here!